The UTHealth School of Public Health's school-wide academic advising system incorporates the components of day-to-day advising for students on specific degree requirements, academic policy and navigation of the UTHealth School of Public Health (SPH) student administrative processes at all campuses, while maintaining the value and importance of the role of the faculty as research and educational mentors. This new model of advising will be coordinated centrally with shared responsibilities in the departments and at the regional campuses. The goals of the program are to make trained staff advisors available and accessible, knowledgeable, helpful, approachable and accountable. Staff advisors are knowledgeable staff members of Academic Affairs, Career Services, department/regional campuses, and Student Affairs. Through Central Staff Advising, students are provided guidance in selecting courses in accordance with the appropriate degree planner and academic requirements. Students are also provided guidance on UTHealth SPH website navigation. They are also provided information on policies and procedures, enrollment process, career services, dual degree options, guidelines, deadlines, certificate options, and customized MPH degree programs. Academic advisory committees are constituted to enable students to meet their academic and research goals. The composition requirements of the different committees for each degree program are described on the degree tabs above. Faculty Advisors are typically faculty members who have a primary, full-time appointment in the UTHealth School of Public Health. Adjunct faculty and most faculty members with cross-appointments will serve as the second, third or optional member on the student’s advisory committee. In exceptional cases, a cross-appointed or adjunct faculty member may be granted extended privileges, including that of an academic advisor. If a student wants to change his or her faculty advisor, he or she will need to identify another professor from the department to consider being his or her faculty advisor. The student will then need to speak with that professor to verify his or her interests and availability to serve as the student’s faculty advisor. The links below provide a list of professors in each department from which the student could choose. The student must select a fully appointed UTHealth SPH faculty member from his or her department. Students can request to change their faculty advisor via the Change of Advisor Request form. Please submit the completed form to the Office of Academic Affairs & Student Affairs for final approval. Students will receive notification of approval via email. An academic advisor (either the departmental or regional campus centralized advisor or a departmental or regional campus faculty member) is assigned to students at the time of admission. MPH students who elect a certificate will be required to add one additional member to his or her committee to represent the certificate (unless the advisor also represents the certificate ). Students who chooses to complete a written culminating experience (e.g., thesis), may add a second member from within or outside the school. Committee membership is approved by the Associate Dean for Student Affairs. During evaluation week at the end of each fall and spring semesters, each MPH student meets with his or her advisory committee to review the academic plan and the student’s progress toward completion of the degree program. The completed Optional Member Appointment – MPH Committee Form must be submitted to the Office of Student Affairs for final approval. Students will receive approval notification via email. You can appoint someone other than your academic advisor as your MPH Thesis Supervisor. This supervisor may already be on your committee or can be someone that is on the UTHealth SPH adjunct faculty list or is at another academic or public health-related organization. A thesis supervisor from outside the school must be approved by your Student Advisory Committee. If the Thesis Supervisor is not affiliated with UTHealth SPH, your Student Advisory Committee should review his/her credentials and suitability for serving your academic needs. Please provide a resume or CV for our database. Note that UTHealth SPH adjunct faculty have been previously reviewed by the Disciplines and require no further documentation. Please submit the completed MPH Thesis Supervisor Appointment Form to the Office of Student Affairs for final approval. Students will receive notification of approval via email. The MS Advisory Committee typically consists of two full-time UTHealth SPH faculty members. A faculty advisor representing the student’s major field of study is appointed during the admissions process. During the first semester of enrollment, the student and faculty advisor select one additional regular faculty member from a minor area. This member along with the faculty advisor constitutes the student’s advisory committee. The committee assists in the selection of a course of study and related academic matters and evaluates the student’s academic progress. A third optional member of the committee may be selected to contribute special expertise to the student’s research, provided that the committee is in agreement. The optional committee member may belong to UTHealth SPH or another academic institution. If the optional member is from another academic institution and does not hold an adjunct appointment in the SPH, the SPH faculty members on the MS Advisory Committee are responsible for collecting and reviewing his/her credentials. These credentials usually consist of a current CV containing the person’s present appointment and evidence of his/her research experience. Any member of the MS Advisory Committee, including the optional member, may serve as the thesis supervisor. The completed MS Committee Appointment Form must be submitted to the Office of Student Affairs for final approval. Students will receive notification of approval via email. You can appoint someone other than your academic advisor as your MS Thesis Supervisor. This supervisor may already be on your committee or can be someone that is on the UTHealth SPH adjunct faculty list or is at another academic or public health-related organization. A thesis supervisor from outside the school must be approved by your Student Advisory Committee. If the Thesis Supervisor is not affiliated with the SPH, your Student Advisory Committee should review his/her credentials and suitability for serving your academic needs. Please provide a resume or vita for our database. Note that SPH adjunct faculty have been previously reviewed by the Disciplines and require no further documentation. The completed MS Thesis Supervisor Form must be submitted to the Office of Student Affairs for final approval. Students will receive notification of approval via email. All admitted DrPH students are assigned an academic advisor who will assist the student in preparing for the preliminary examination. Successful completion of the preliminary examination advances the doctoral student to a doctoral candidate. At this time, the student will constitute a Dissertation Committee. Upon successful completion of the preliminary exam, students will constitute a dissertation committee composed of an academic advisor (who may or may not be the qualifying academic advisor) and two other members representing the breadth and minor areas of interest. Dissertation supervisor may be added, and may come from an outside institution. The dissertation committee will help develop curriculum that supports the student’s research and career goals. This committee can be changed as research interests become more focused. The dissertation committee will also be responsible for evaluating the oral defense of the dissertation research proposal and the oral defense of the completed dissertation. The Committee membership must be approved by the Associate Dean for Academic Affairs. The dissertation requirement will be fulfilled when the document has been approved and signed by all members of the Dissertation Committee, a copy has been filed in the Dean’s office, and an oral presentation of the work has taken place. Please submit the completed forms to the Office of Student Affairs for final approval. Student forms can be found here. The DrPH Qualifying Committee assists the student in the academic preparation for the qualifying examination, constructs and administers the exam to test for competency in public health disciplines, oversees its grading, and communicates the results to the student. This committee typically consists of at least three regular (i.e. full-time) faculty members, including an academic advisor, who is selected during the admissions process, and two faculty representing different public health disciplines. The two additional members of the committee are identified by the academic advisor and the student and serve on the committee by choice. These two faculty members represent the breadth of the DrPH degree program and come from different disciplines. However, in some cases two faculty members may come from the same department. For example, an epidemiologist in a department other than Epidemiology and Disease Control may serve as an epidemiologist on a committee for a student in Management, Policy and Community Health. Further, it should be noted that the Department of Epidemiology houses two disciplines (Epidemiology and Biological Sciences). Faculty from each of these disciplines may serve on the same Qualifying Committee. In any case, at least one member of the committee must be from another discipline (and department). The Qualifying Committee should be appointed by the end of the first semester of the student’s enrollment in the DrPH program or shortly thereafter. The student is tested on the breadth of public health disciplines, and successful completion of the qualifying examination converts the doctoral student to doctoral candidate. Once the student has been admitted to candidacy, the Qualifying Committee is automatically dissolved. The Qualifying Committee is replaced by the Dissertation Committee. Please note: faculty representing the Epidemiology Department on a Qualifying Committee need to have a primary appointment in the Epidemiology department. The Dissertation committee, which typically consists of at least three members of the regular (i.e. full-time) faculty guides the candidate’s research and reviews and approves the dissertation. During the first semester of enrollment following the admission to candidacy, the student selects an academic advisor, and together, the advisor and student identify at least two additional members of the SPH faculty (from any department) who are willing to serve on the Dissertation Committee. A fourth optional member of the committee may be selected to contribute special expertise to the candidate’s research, provided that the committee is in agreement. The optional committee member may belong to the SPH or another academic institution. If the optional member is from another academic institution and does not hold an adjunct appointment in the SPH, the SPH faculty members on the Dissertation Committee are responsible for collecting and reviewing his/her credentials. These credentials usually consist of a current CV containing the person’s present appointment and evidence of his/her research expertise. Any member of the Dissertation Committee, including the optional member, may serve as the dissertation supervisor. The dissertation requirement will be fulfilled when the document describing the research and its findings has been approved and signed by all members of the Dissertation Committee, a copy has been filed in the Dean’s office, and an oral presentation has taken place. All admitted students will be assigned a faculty academic advisor at admission who will guide them through the course prerequisite to the preliminary exam. Upon successful completion of the preliminary examination, students will constitute a Dissertation Committee. Upon successful completion of the preliminary exam, students will constitute a dissertation committee composed of a faculty academic advisor (who may or may not be the qualifying faculty academic advisor) and two other members representing the breadth and minor areas of interest. Dissertation supervisor may be added, and may come from an outside institution. The dissertation committee will help develop curriculum that supports the student’s research and career goals. This committee can be changed as research interests become more focused. The dissertation committee will also be responsible for evaluating the oral defense of the dissertation research proposal and the oral defense of the completed dissertation. The PhD Qualifying Committee assists the student in the academic preparation for the qualifying examination, constructs and administers the exam, oversees the grading, and communicates the results to the student. This committee typically consists of at least three full-time faculty members, including an academic advisor, who is selected during the admissions process, and two faculty members representing the student’s minor areas of study. Minors may be selected from the disciplines represented among the School’s departments. Thus, these faculty members typically come from different departments. However, the Department of Management, Policy and Community Health has three defined tracks that students may choose from: Economics, Policy, and Management. For students majoring in one of the MPACH tracks, one minor may be chosen from a different track. In this case, the second minor must be from a different department. The Qualifying Committee should be appointed by the end of the first semester of the student’s enrollment in the PhD program or shortly thereafter. Successful completion of the qualifying examination converts the doctoral student to a doctoral candidate, and the Qualifying Committee is automatically dissolved. After the student’s admission to candidacy, the Qualifying Committee is replaced by the Dissertation Committee. The Dissertation committee, which typically consists of at least three full-time faculty members, guides the candidate’s research and reviews and approves the dissertation. During the first semester of enrollment following the admission to candidacy, the student selects an academic advisor, and together, the advisor and student identify at least two additional members of the SPH faculty who are willing to serve on the Dissertation Committee. The second member of the committee belongs to the student’s major discipline, while the third member represents a different discipline, oftentimes one of the student’s minor areas of study. A fourth optional member of the committee may be selected to contribute special expertise to the candidate’s research, provided that the committee is in agreement. The optional committee member may belong to the SPH or another academic institution. If the optional member is from another academic institution and does not hold an adjunct appointment in the SPH, the SPH faculty members on the Dissertation Committee are responsible for collecting and reviewing his/her credentials. These credentials usually consist of a current CV containing the person’s present appointment and evidence of his/her research experience. Any member of the Dissertation Committee, including the optional member, may serve as the dissertation supervisor. The dissertation requirement will be fulfilled when the manuscript describing the research and its findings has been approved and signed by all members of the Dissertation Committee, a copy has been filed in the Dean’s office, and an oral presentation has taken place. An academic advisor (either the departmental or regional campus centralized advisor or a departmental or regional campus faculty member) is assigned to students at the time of admission. MPH students who elect a certificate will be required to add one additional member to his or her committee to represent the certificate (unless the advisor also represents the certificate ). Students who choose to complete a written culminating experience (e.g., thesis), may add a second member from within or outside the school. Committee membership is approved by the Associate Dean for Student Affairs. During evaluation week at the end of each fall and spring semesters, each MPH student meets with his or her advisory committee to review the academic plan and the student’s progress toward completion of the degree program. You can appoint someone other than your academic advisor as your MPH Thesis Supervisor. This supervisor may already be on your committee or can be someone that is on the SPH adjunct faculty list or is at another academic or public health-related organization. A thesis supervisor from outside the school must be approved by your Student Advisory Committee. The MS Advisory Committee typically consists of two full-time UTHealth School of Public Health (SPH) faculty members. A faculty advisor representing the student’s major field of study is appointed during the admissions process. During the first semester of enrollment, the student and faculty advisor select one additional regular faculty member from a minor area. This member along with the faculty advisor constitutes the student’s advisory committee. The committee assists in the selection of a course of study and related academic matters and evaluates the student’s academic progress. A third optional member of the committee may be selected to contribute special expertise to the student’s research, provided that the committee is in agreement. The optional committee member may belong to UTHealth SPH or another academic institution. If the optional member is from another academic institution and does not hold an adjunct appointment in the SPH, the SPH faculty members on the MS Advisory Committee are responsible for collecting and reviewing his/her credentials. These credentials usually consist of a current CV containing the person’s present appointment and evidence of his/her research experience. Any member of the MS Advisory Committee, including the optional member, may serve as the thesis supervisor. You can appoint someone other than your academic advisor as your MS Thesis Supervisor. This supervisor may already be on your committee or can be someone that is on the UTHealth SPH adjunct faculty list or is at another academic or public health-related organization. A thesis supervisor from outside the school must be approved by your Student Advisory Committee. If the Thesis Supervisor is not affiliated with the SPH, your Student Advisory Committee should review his/her credentials and suitability for serving your academic needs. Please provide a resume or vita for our database. Note that UTHealth SPH adjunct faculty have been previously reviewed by the Disciplines and require no further documentation. The Dissertation committee, which typically consists of at least three members of the regular (i.e. full-time) faculty guides the candidate’s research and reviews and approves the dissertation. 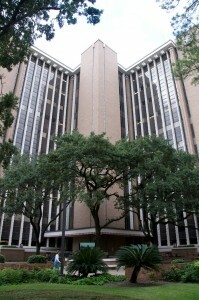 During the first semester of enrollment following the admission to candidacy, the student selects an academic advisor, and together, the advisor and student identify at least two additional members of the UTHealth SPH faculty (from any department) who are willing to serve on the Dissertation Committee. A fourth optional member of the committee may be selected to contribute special expertise to the candidate’s research, provided that the committee is in agreement. The optional committee member may belong to the UTHealth SPH or another academic institution. If the optional member is from another academic institution and does not hold an adjunct appointment in the SPH, the SPH faculty members on the Dissertation Committee are responsible for collecting and reviewing his/her credentials. These credentials usually consist of a current CV containing the person’s present appointment and evidence of his/her research expertise. Any member of the Dissertation Committee, including the optional member, may serve as the dissertation supervisor. The dissertation requirement will be fulfilled when the document describing the research and its findings has been approved and signed by all members of the Dissertation Committee, a copy has been filed in the Dean’s office, and an oral presentation has taken place. Each department and campus has staff dedicated to answering your questions and to assist you with academic planning. To determine which staff advisor is right for you, please refer to the Administrative Responsibilities guide and Academic Advising Contacts list.